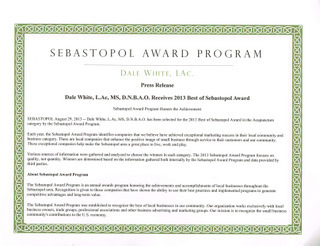 Dale White, M.S., LAc., D.N.B.A.O. 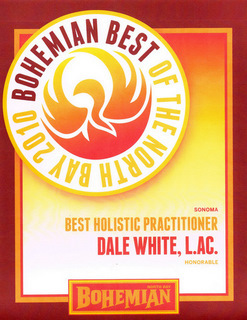 My practice offers an eclectic blend of medical traditions from Asia, Europe and the U.S. including 9 different styles of Acupuncture, German Biological Medicine, European Drainage Homeopathy, Orthomolecular Medicine, Chinese & Western Herbal Medicine, Targeted Amino Acid Therapy, Whole Food Nutritional Therapy and diet and life style counseling. 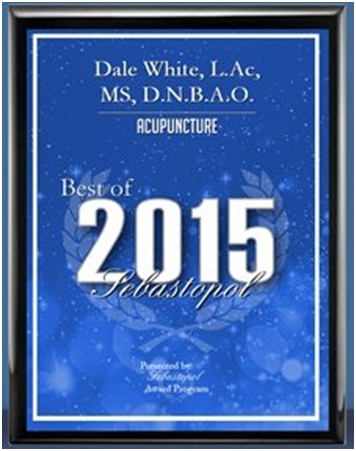 I have advanced training in hormone balancing, detoxification therapy, Hepatitis C treatment, and neurological acupuncture for conditions such as stroke, spinal cord injuries, MS and Parkinson’s. There are general principals to the practice of natural medicine, however, every individual will need a different starting place and process depending on their history and the nature of their health issue. Having a broad viewpoint and depth of knowledge allows me to be flexible with my patients in different phases of their life and healing. Most clients visit our clinic for evaluation and treatment but I also am happy to provide phone and email consultation and guidance. Finances are an issue for almost everyone these days and I want patients to walk out of my office feeling like they got what they needed at a good value. Rather than telling you what to do, I like to explain what I see, how it fits together with your experience, understand what your priorities and limitations are and then create a plan based on collaborative decision making. To make the patient feel safe, comfortable and cared for. To listen to what the patient is saying and listen for what the patient is asking for. To practice healing rather than medicine. To work with the patient rather than doing something to or for them. To provide expert information, encouragement & guidance to help the patient achieve their health & healing goals. To address the patient's concerns. To relieve the patient's symptoms. To work with the patient on core fundamental issues and practices that build a stable foundation for continuing health and healing. Not intended to diagnose, prescribe for, treat, or claim to prevent, mitigate or cure any disease. The statements made on these web sites have not been evaluated by the Food and Drug Administration. Consumers are cautioned to read all labels and follow all directions. If you have a disease (such as heart disease, high blood pressure, diabetes) or a medical condition (such as pregnancy) or are under the age of 18, you should consult with your physician before using these products. 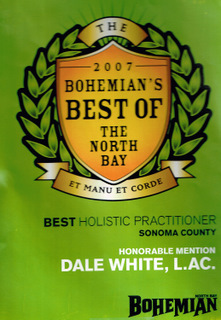 AWARDS - DALE WHITE, LAc.